So, it's been a while since my last update. Life does seem to have a nasty habit of getting in the way and for me this was Christmas and the fun that Financial Year End brings (yes, I'm in Finance ZZZZZZzzzzzzzz). So, when last I posted I'd completed 1000pts and this was back in late October/early November. Now I did actually manage to finish my 500pts for November and I even posted some photos to my Facebook account but I didn't post them here for shame! 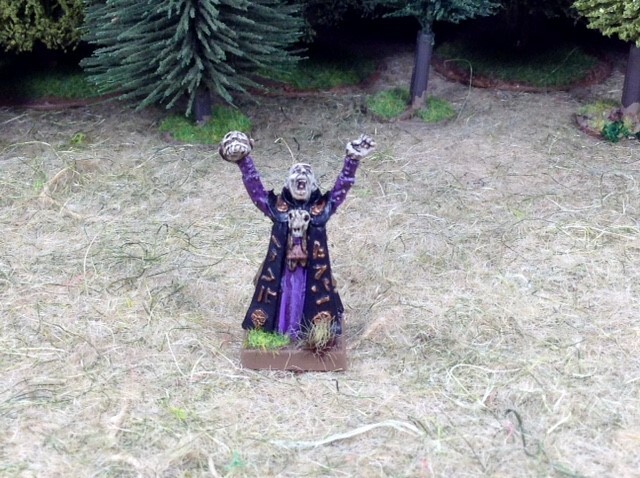 So, this update is a double hit, I'll start with Novembers offerings and then show you January's 500pts which brings me up to 2000pts of Undead. Hold on, November and January - where's December?????? My fellow protagonists and I decided to take a break in December to allow for life to happen. I'm back at it and I'm sure the others won;t be far behind. 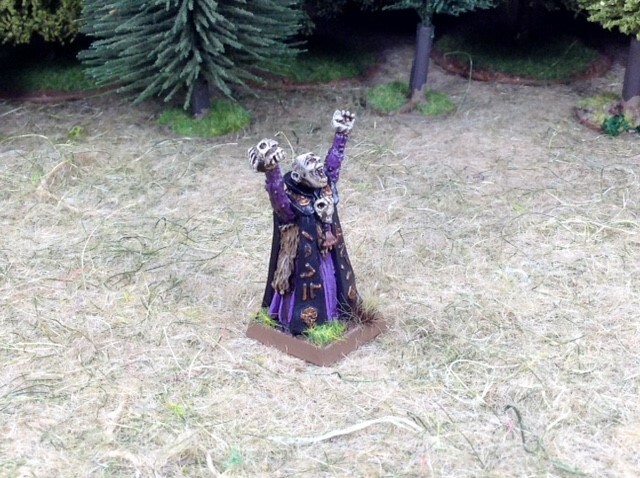 Lothar paced about the room, the Master would be joining them soon and he didn't feel his army had been fully assembled nor had he managed to find that damned scroll! A beastly screech drew Lothar's attention to the window, he strode over and looked down into the court yard. 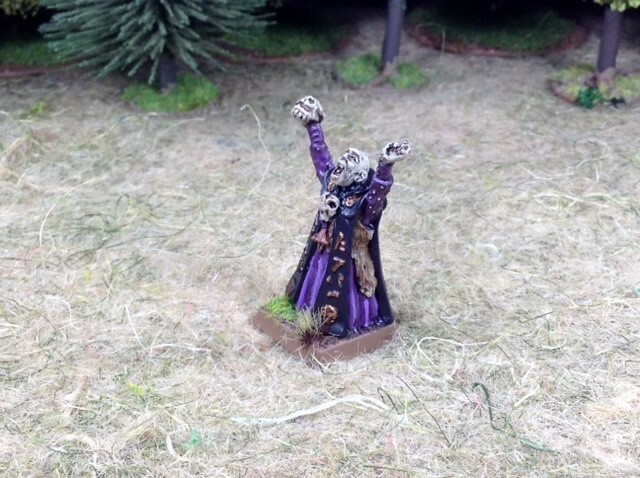 The Carrion had returned from the scavenge hunt, looking for victims for ritual sacrifice for their spells of summoning. 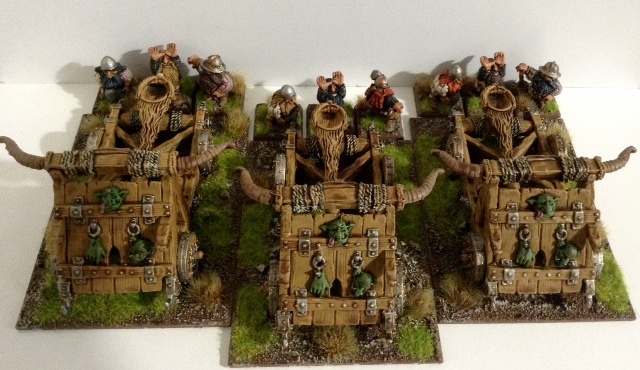 Below them Klein was busy summoning extra Horsemen to add to Krom and his Doom Riders. 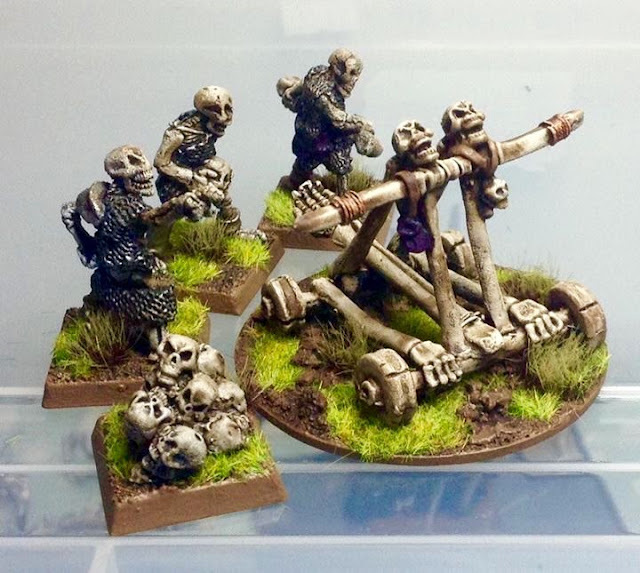 Lothar looked to the ramparts, stood on guard were the remnants of the Gabriel's Fiorento Dead Eyes, a former band of Tilean mercenary crossbowmen that had fallen in battle many years before, the name seemed even more appropriate now that Lothar had brought them back to unlife. 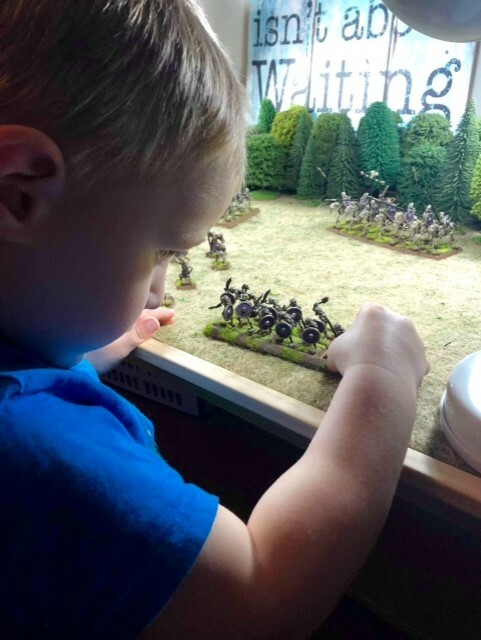 Yes thought Lothar,the army was building nicely but lacked numbers and anything to deliver a hammer blow. Just as Lothar's attention was returning to his hunt for the elusive scroll there came a knocking at the gates followed by a familiar voice. Lothar shivered, if he hated Klein then he hated the owner of this voice even more. 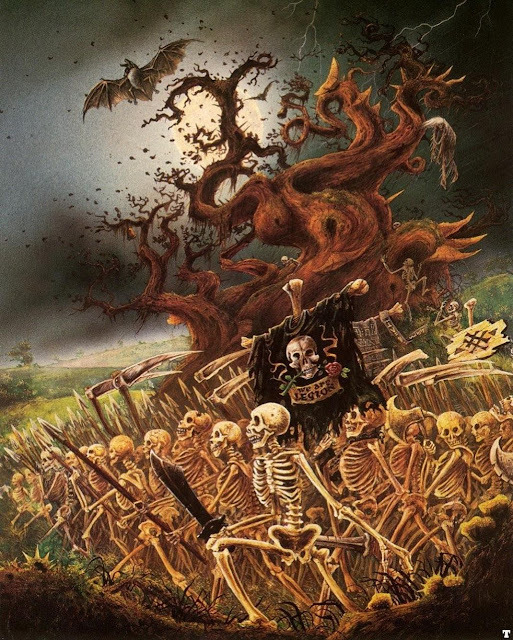 "Let me in Lothar, I have a surprise for you"
Lothar gave a mental command to open the gates and several skeletons did just so and in strode a man with billowing clothes. "What do you want Großeins?" Lother shouted from the window. "What I want Lothar is to join your party, ya?" "Why? "demanded Lothar, "What can you bring to the table?" 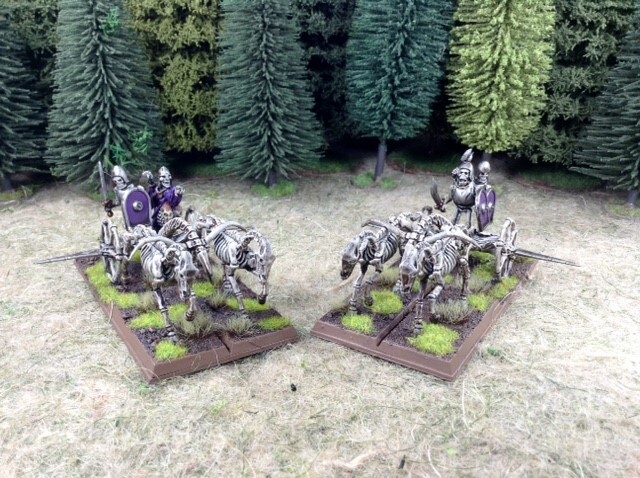 "Simple, I can bring you these"
Großeins beckoned into the gloom on the other side of the gate and with a rattle of bones two chariots rolled in to the courtyard. "Very well Thespian, you can stay" growled Lothar. 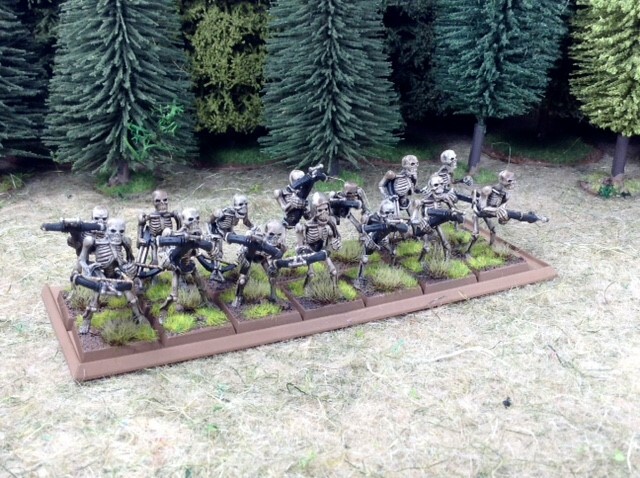 "Take Großeins to the Graveyards of Middenland, I want some "fresh" recruits". Now, where was that damned scroll?????? 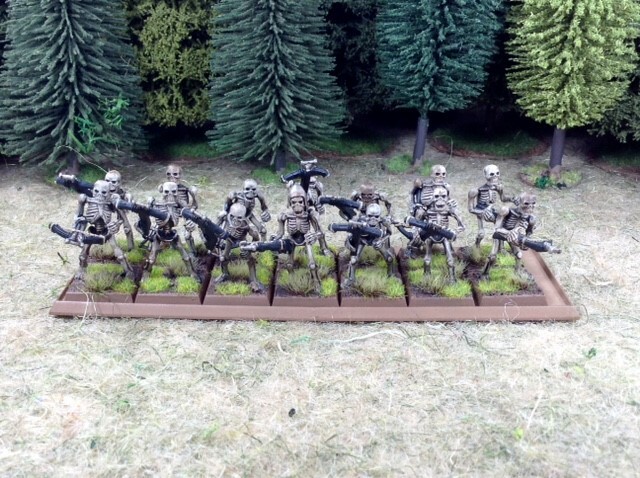 I've decided to add at least one more month's worth of recruits as I'm not sure I have enough Rank & File and I also still have a number of units to finish, as well as Dieter before I have all of the Undead done for the "Revenge of the Doomlord" Scenario I plan to run at BOYL2019. Thanks for stopping by and reading my drivel, any comments you may care to leave will be gratefully received. Work commitments have been heavy of late so painting and posting time has been at an absolute premium. 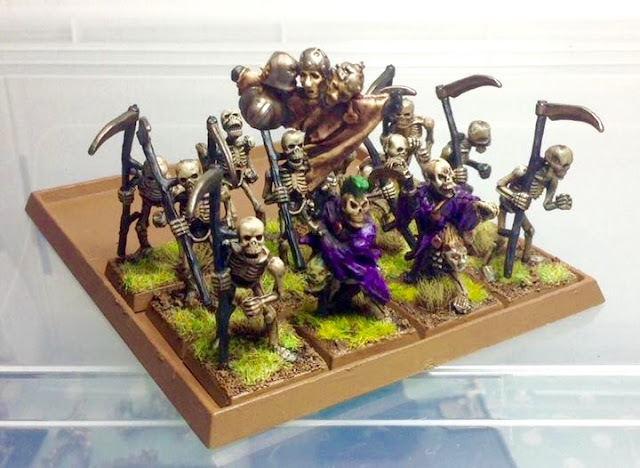 I did manage to finish my next 500 points of Undead before the end of October and I made quick posting to Facebook in time. I wanted to do a full posting of the 1000 points so far, so here it is. Scythe (double-handed weapon), light armour. 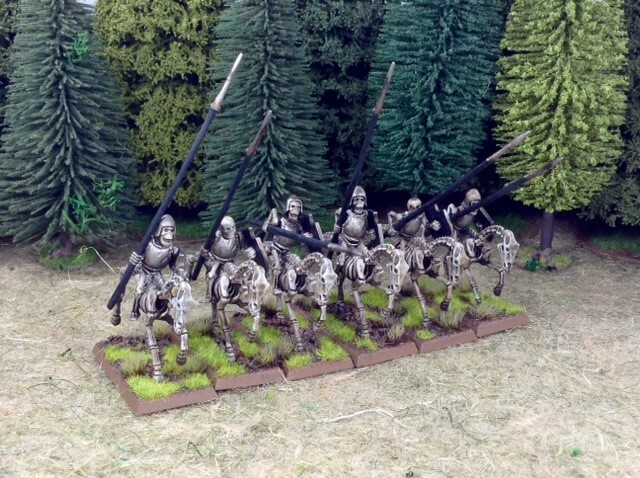 Lances, hand weapons, light armour, shields, undead horses. Lothar threw the scroll to one side, this wasn't the incantation he was after either. The pile of redundant vellum was growing as fast as Lothar's patience was dwindling. 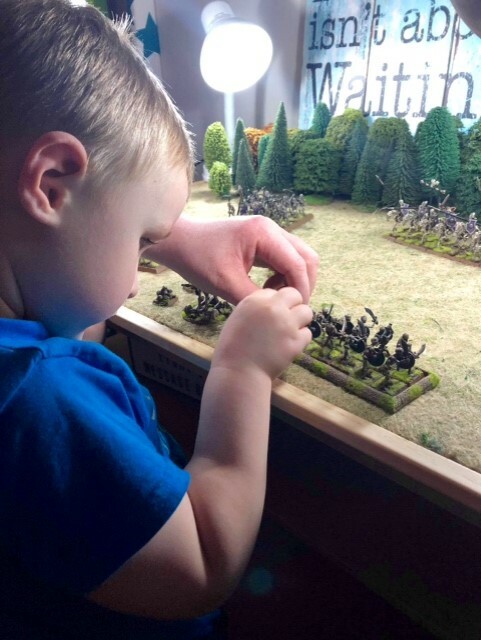 His task to build an army worthy of the Master was weighing heavily on his shoulders. He knew that if he didn't deliver he would join the rotting ranks himself. The door to his chamber creaked open and a wizened old man shuffled in. "I have completed the summoning for the horsemen my Lord" rasped Klein. Lothar turned and looked at the shriveled old man with disdain. He despised the sniveling wretch more than he did anyone else, partially for being in image of the fate that may await himself with the passing of time with exposure to the magic of the dead and partially because hated his toadying. Klein had been shunned for most of his life and had turned to necromancy out of desperation. Now he had found service under Lothar in the Master's vanguard but his need to rise in power and stature in the Master's eyes saw him sycophantically creep up the ladder. Lothar perceived that as weakness and it heightened his hatred all the more. 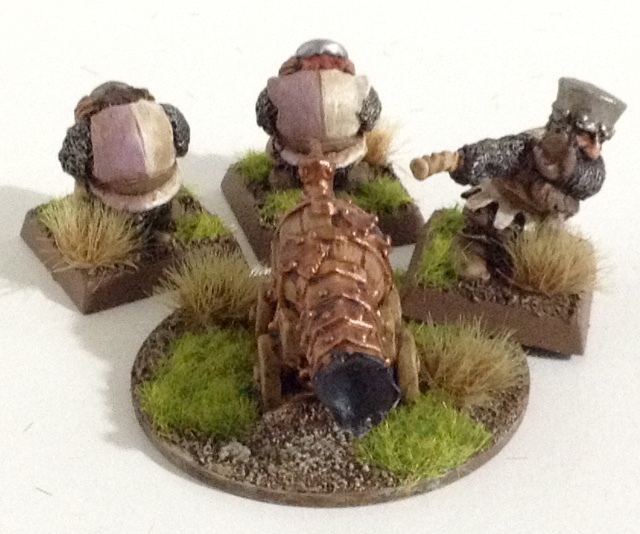 "Lead on old man, I'd best inspect our latest additions" commanded Lothar. Klein nodded and limped out the door. Lothar followed him down the dimly lit corridor and out into the courtyard. Morrslieb shone bright in the night sky, casting an eerie green light over the abandoned keep. 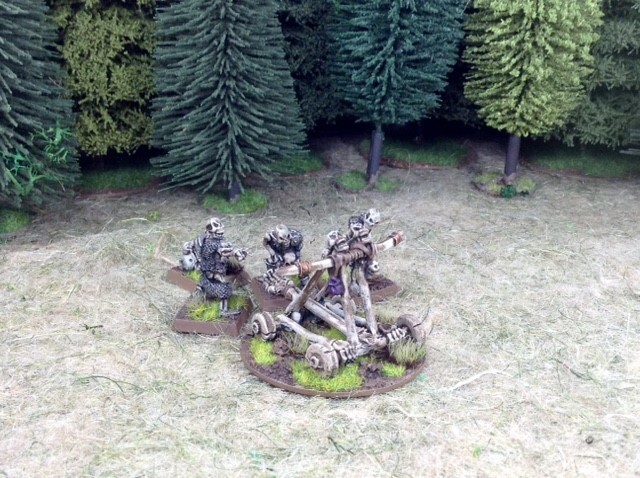 The Skeletons of Lothar's Fallen stood motionless and silent, statues waiting for their call to take up arms. 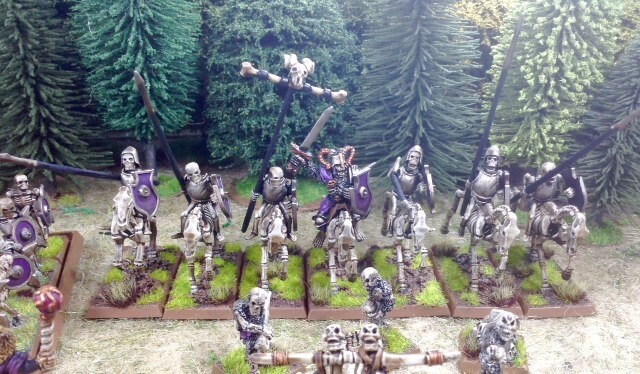 The mighty iron gates were guarded by Varga's Reapers. Varga stood sentinel like directly behind the portcullis, scythe in hand. Lothar knew anyone attempting to enter the gateway would be challenged by Varga and his "men". 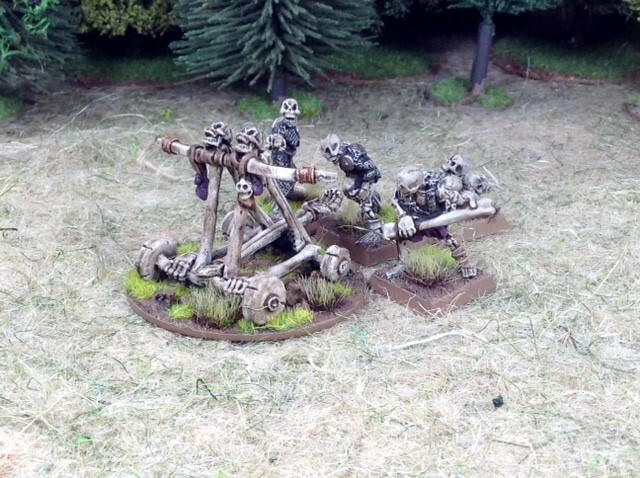 Lothar saw movement out of the corner of his eye, he turned slightly to see the catapult crew staking skulls. He made a mental note to order Klein to enact the ritual of remembrance on the pile of heads, he wanted them to remember the horrific way they were harvested so that their death screams would sound as they flew through the air towards the enemy. 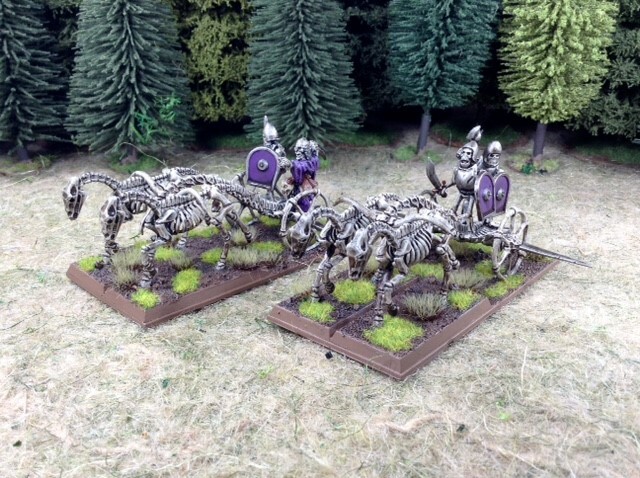 Klein stopped in front of a line of skeletal horses. Lothar looked along the line at the riders, his eyes fixing upon their leader. 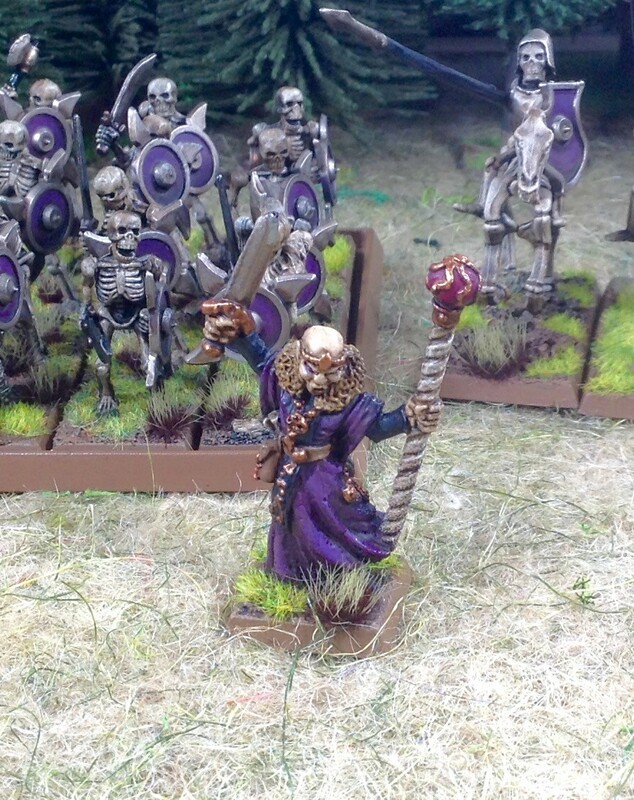 The purple light burning in his eye sockets flared as he looked back at Lother, who heard the Skeleton Captain's words in his mind. "I, Krom, lead the Doomriders in the name of the Master, under your leadership"
"Your servitude is accepted" Lothar replied. 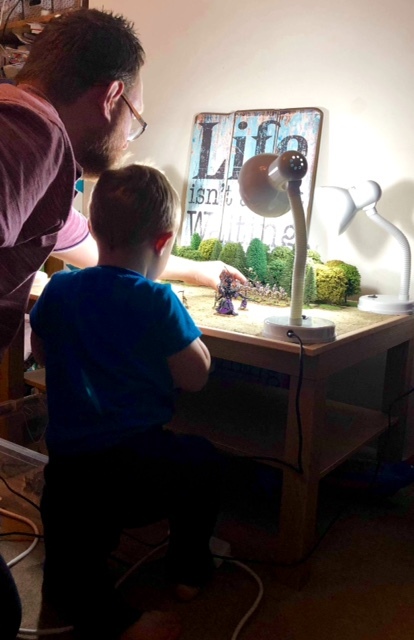 As I set this all up my Son's curiosity was peaked and so I let him have a go first, so, if you will allow it I will digress a little into the indulgence of photo's of "Dadhammer". 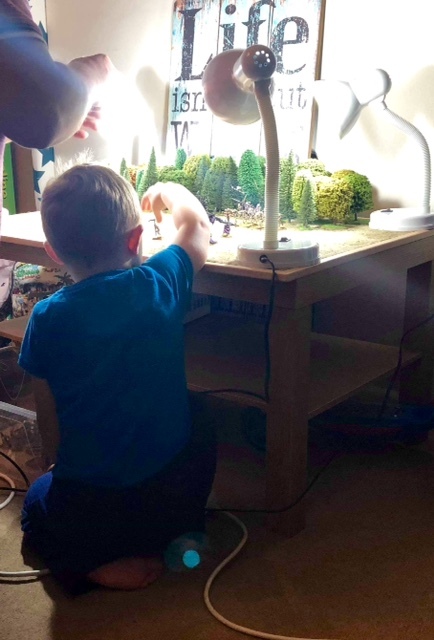 This is what all parents want to see, their offspring taking an interest in their own hobby. A terribly cheesy smile on my face but words can't describe how happy and proud this made me. 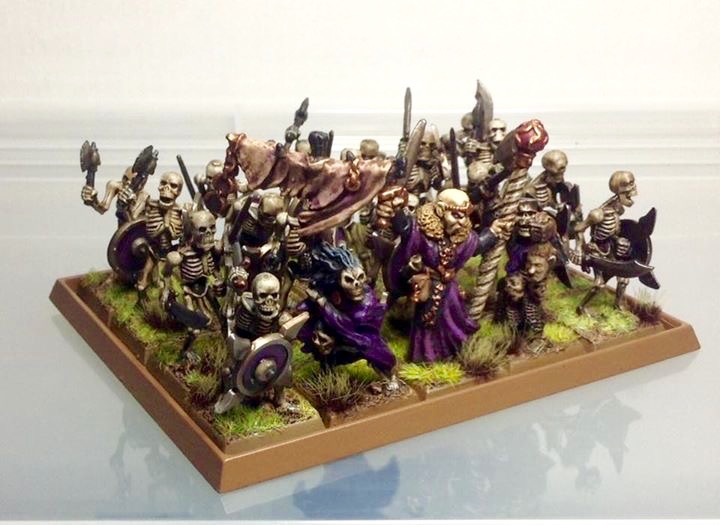 So, my first 500pts of Undead was finished with about 30 minutes to spare on the deadline of midnight on the 30th of September. I posted images up to Facebook but didn't post to my blog as it was late. the next couple of days I had work commitments to attend to so this is the first chance I've had to post about my efforts. 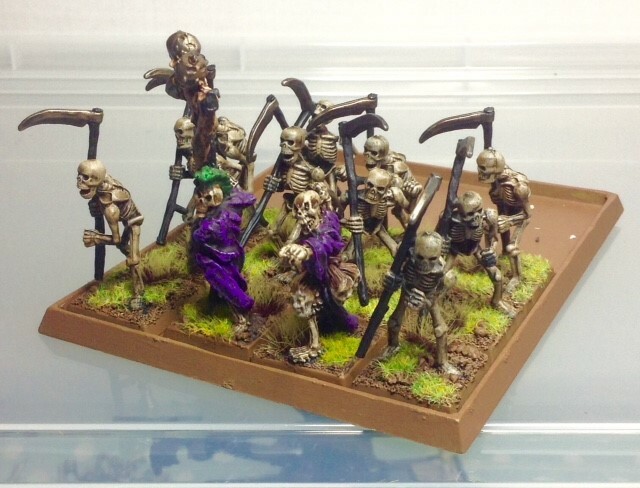 As you'll see from the photo's, I've actually painted up a few more skellies than I've paid the points for, this is the beginning of my summoning bank (i.e. 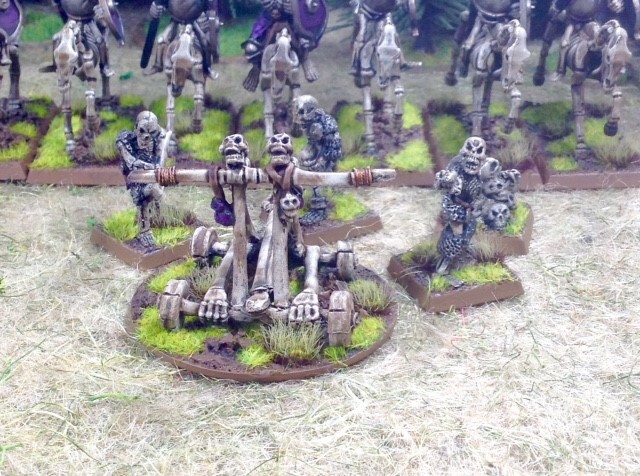 Skeletons I can summon up during the battle in various editions) and I've also added a Champion to my hand weapon armed Warriors that isn't in the list. 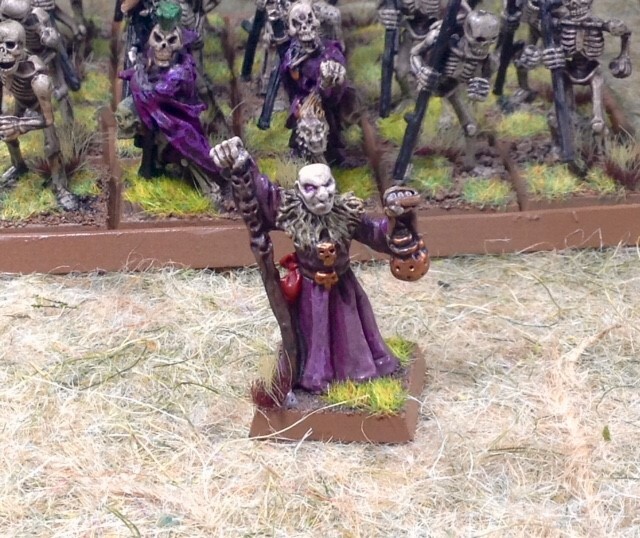 My plan is to summon up their Champion at the beginning of the game and by taking a level 10 Necromancer I know I'll get correct spell as there are only 5 Necromantic spells for level 1 and Lothar gets 6 1st level spells, bingo, I defo get the right spell. 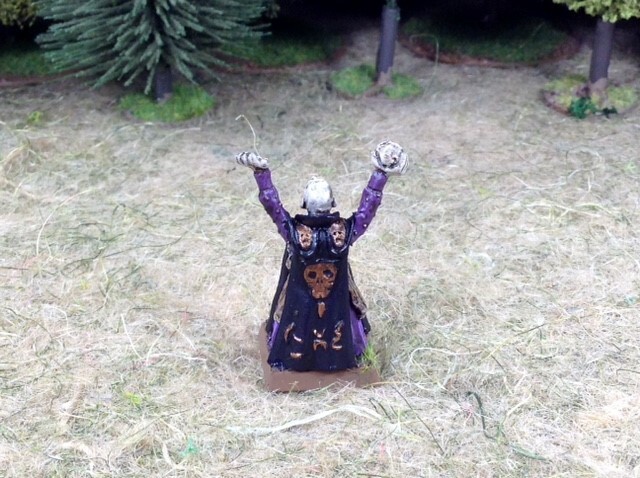 My Standards are, whilst being unquestionably Oldhammer minis, just not quite Oldhammer in that they don't have big unruly banners. 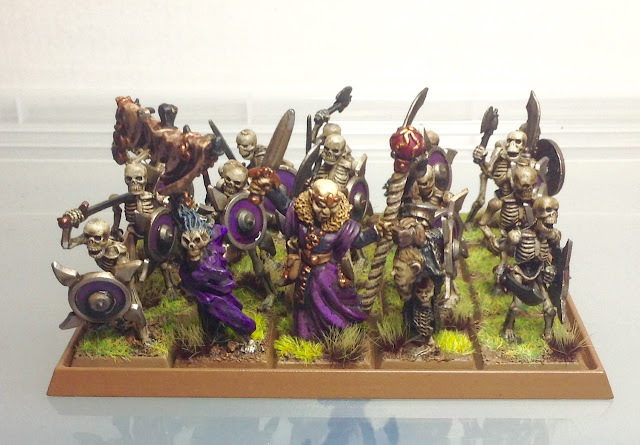 I plan to replace these guys in the future when I'm painted up some decent banners. Incidentally, the two Standards i have painted up look a little plain, that's intentional, I wanted them to look like flayed skin, not sure if it comes across. No points for Screaming Skull Ammunition for the Catapult. Definitely a situation to be corrected in my next 500pts. Righteo, am off to plan my next month's batch. 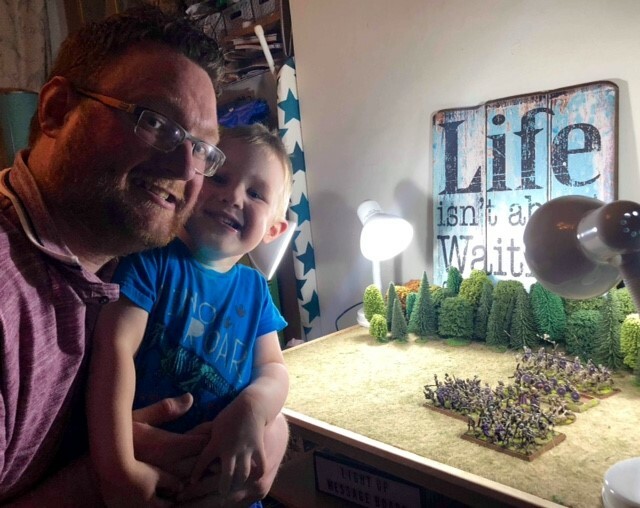 Richard Legg - my BOYL army building competitor of the last two years. 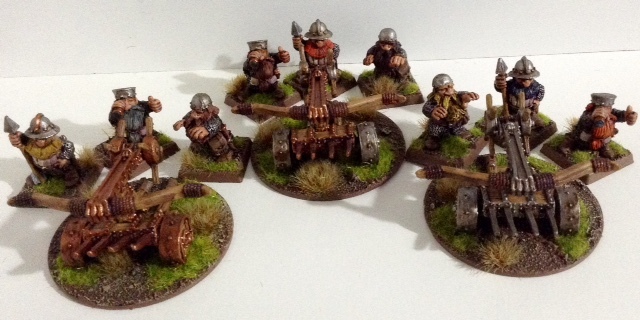 Richard built up his Orcs and Goblins to a grand horde of Greenskins. Geoff Solomon-Simms - Master sculptor extraordinaire, gaming wise I mostly know Geoff for his Fimir but he regularly turns his hand to many a project. Erny - My Brother and proprietor of Erny's Place who should be dusting off the cobwebs and inviting us all in again soon. 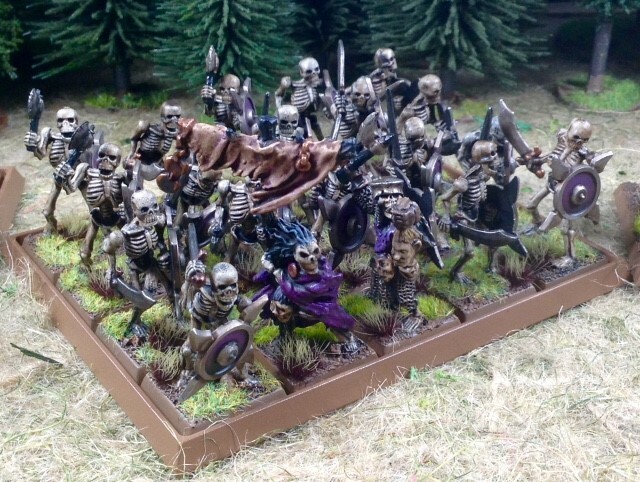 So, starting in September we plan to build up armies by adding 500pts a month for four months and by the end of the year we'll have shiny new 2000pt 3rd Edition armies. Come BOYL2019 we'll have a big battle between us all. You'll notice I have not yet stated which armies we have each picked, this is intentional, partially because I haven't double checked with each which army they have finally settled upon but also because I don't want to steal their thunder of their own big reveals. I can of course let in on my own choice. 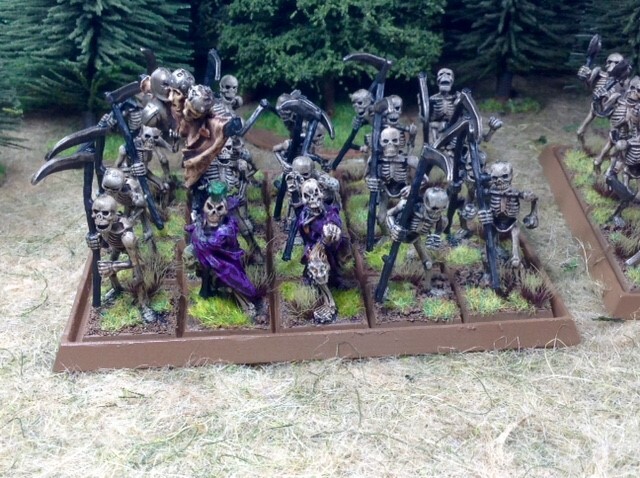 My reasons for picking Undead are two fold. 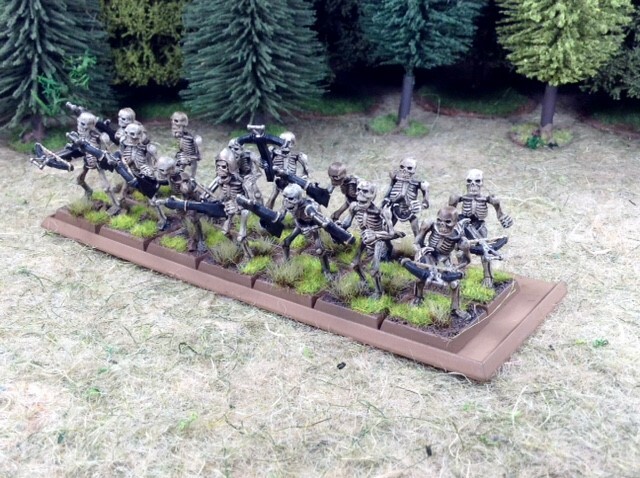 Firstly Undead are one of top three favourite armies in Warhammer. 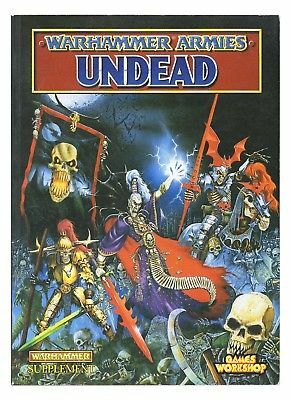 My first flick through Warhammer Armies 3rd Ed had me interested in Skaven, Dwarves and Undead and whilst I never collected my own 3rd Ed army back in the day as I used Erny's as I was more into spending my pocket money on Transformers back then. 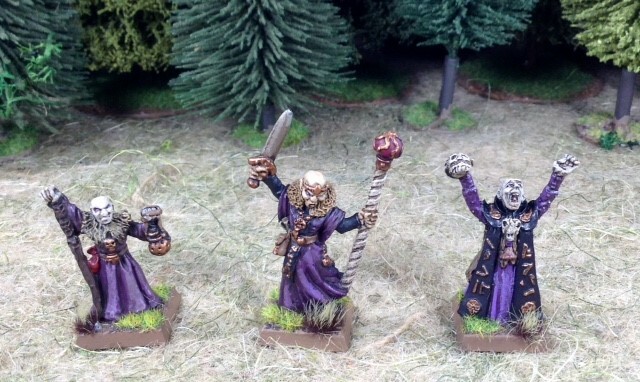 I started thinking of buying my first army at what turned out to be the very end of 3rd Ed and then 4th Ed came along and I plumped for High Elves with their revamp. 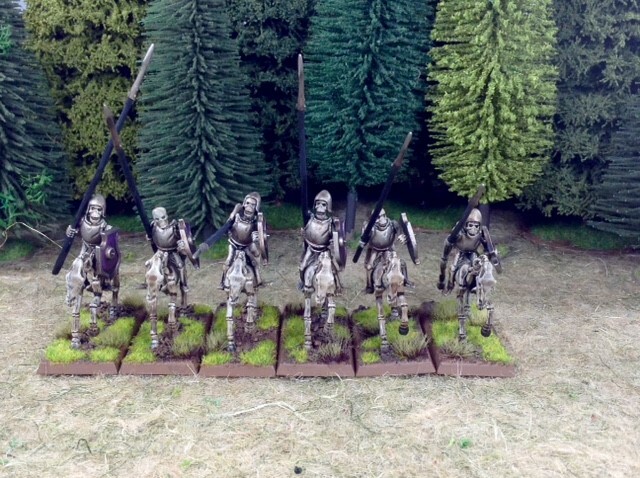 I did however retain my inkling towards the Undead Army and bought and gamed with Undead in 4th and they actually became my usual army of choice back then, mostly because they were cheap as chips plastics. 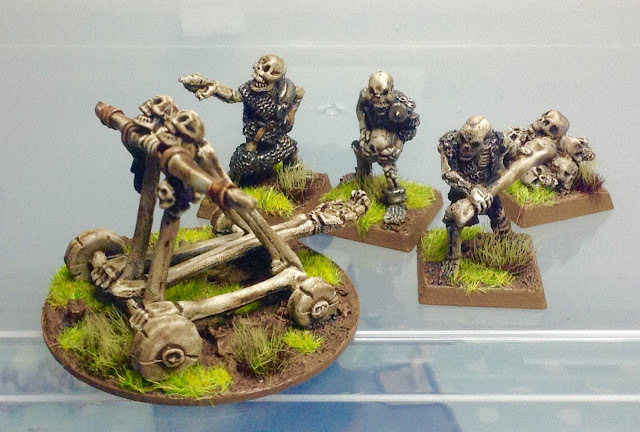 I never really painted them though back then. 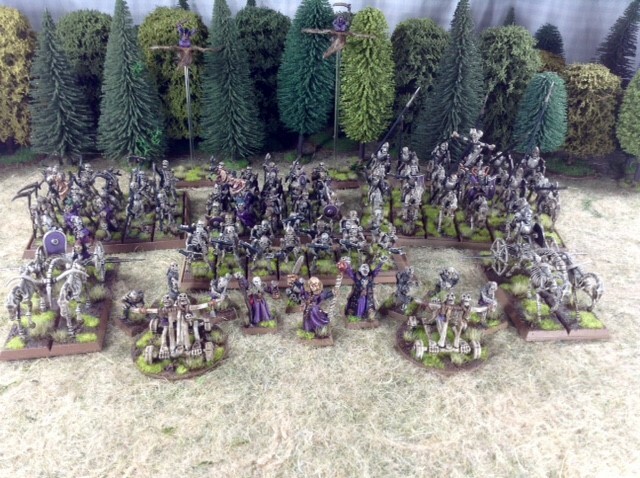 I did paint a Vampire Count army a while back for 6th but if I'm honest the Gothic feel of a Vampire Counts army never really had the same feel for me as a High Fantasy Undead Army and that is what I want to recreate. 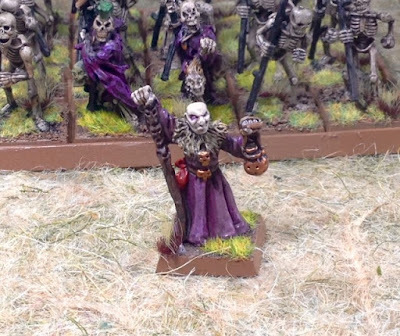 My second reason for choosing Undead is my desire to run the 4th Edition scenario "Revenge of the Doomlord" scenario at BOYL2019. I keep promising to run this scenario at BOYL and this year I plan to deliver. 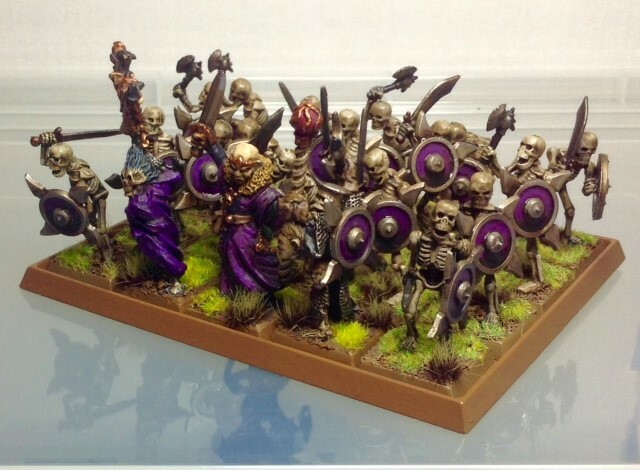 My sneaky plan is to use the scenario troop roster as the basis of my 2000 point 3rd Ed Army. 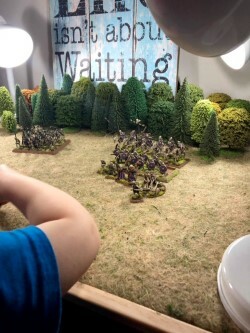 The point differences between 3rd and 4th are minimal and the army is the scenario is 2500 points with 750 points of that being Dieter Helsnicht astride his Manticore. 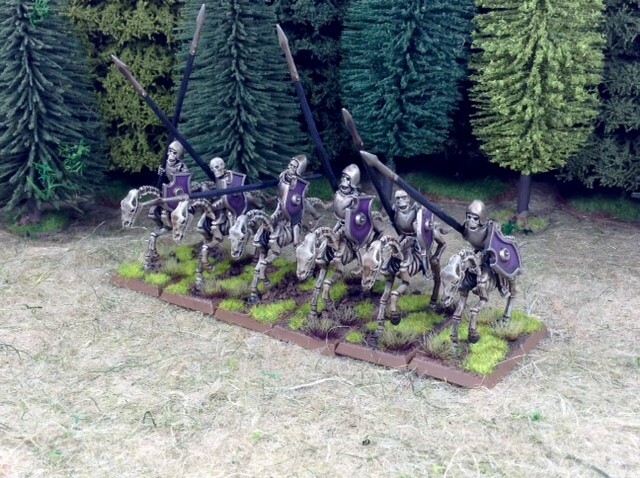 There is also an army standard bearer on skeleton steed that can be a Death Rider standard bearer as neither of the units of cavalry in the scenario have a standard bearer.. So, what do I have to work with? 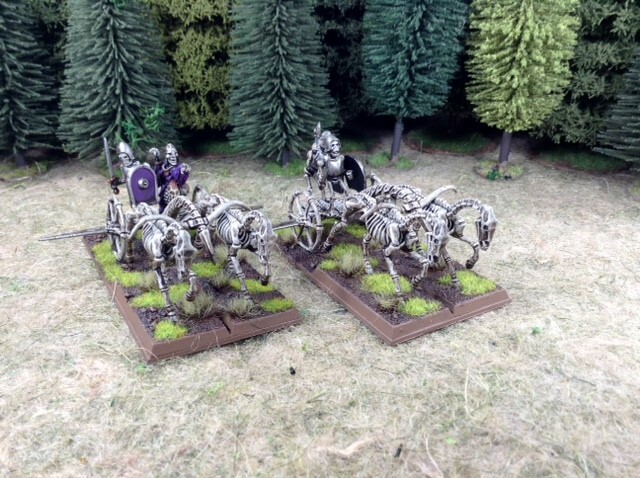 2 units of 5 Skeleton Horsemen, 1 Army Standard Bearer/11 Death Riders with Standard Bearer, 1 Wight Lord/Undead Champion. 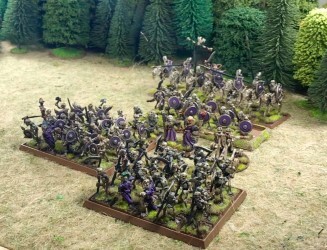 25 Skeleton Warriors, 1 Wight Lord/Undead Champion. 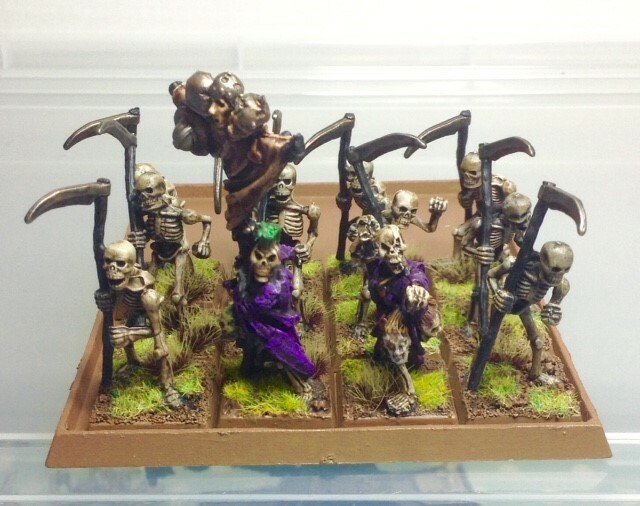 I'll also need to paint up a unit of Grim Reapers to comply with 3rd Ed minimum troop requirements and some Necromancers (Dieter will be for the Scenario, I don't intend him to appear in my 3rd Ed army (rules wouldn't allow it anyhow)). 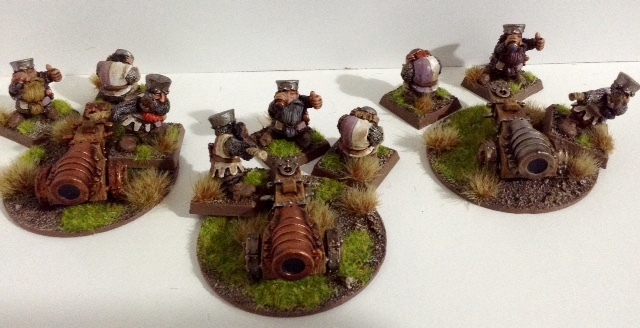 OK, so BOYL was the next day and I needed to get some artillery painted fast so I cheated. Like BUGGERY was I going to let that happen so I picked up the Desert Yellow Spray and hoped for the best. And boy am I glad did! 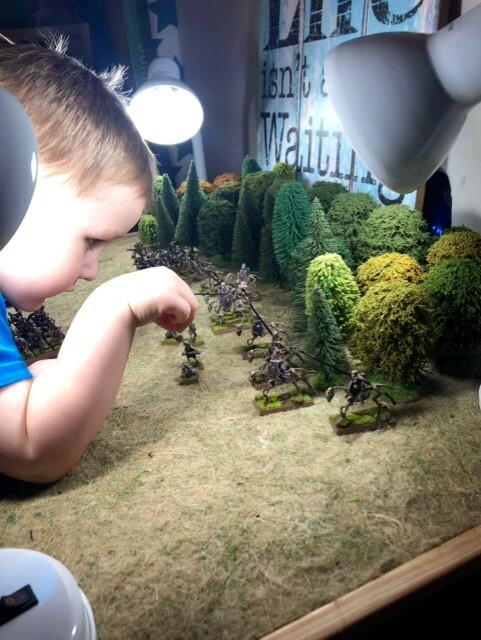 Spraying them and then just painting the detail was a master stroke. I think my gamble paid off and I'm really happy with the outcome. Yes it's simple but it works and they drew lots of compliments at BOYL with people amazed at how easy the method was. 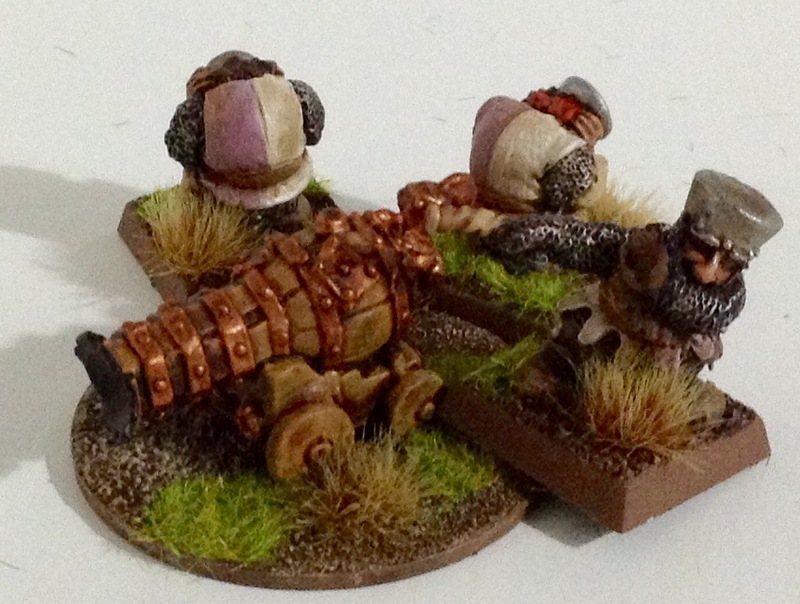 Time for me to toddle now but I hope to bring you a big run down of the whole army soon. Thanks for stopping by, please leave a comment if you'd be so kind. The FIRST BOYL 4th Ed Battle!